Some of the image captions in this article may require cleanup to comply with Wikipedia guidelines for trivial wording. Roller coaster elements are the individual parts of roller coaster design and operation, such as a track, hill, loop, or turn. Variations in normal track movement that add thrill or excitement to the ride are often called "thrill elements" or "thrill factor". This is when the track twists and tips the train to the side in the direction of the turn. Banking is used to minimize the lateral G-forces on the riders to make the turn more comfortable. More uncommon, however, is the "outward banked turn" which adds an element of interest to the coaster experience. In most cases, this is taken at slower speeds as to not generate uncomfortably high lateral G-forces. When a banked turn continues to create an upward or downward spiral of approximately 360 degrees or more, it is then called a helix. A brake run on a roller coaster is any section of track meant to slow or stop a roller coaster train. Brake runs may be located anywhere or hidden along the circuit of a coaster and may be designed to bring the train to a complete halt or to simply adjust the train's speed. The vast majority of roller coasters do not have any form of braking on the train but rather forms of braking that exist on track sections. One notable exception is the scenic railway roller coaster, which relies on an operator to manually control the speed of the train. On most roller coasters, the brakes are controlled by a computer system, but some older wooden roller coasters have manually operated brakes. These are controlled by large levers operated by the ride operators. A drive tire, or squeeze tire depending on its usage, is essentially a motorized tire used to propel a roller coaster train along a piece of track. Although they are most often used in station areas and brake runs, they can also be used to launch trains at greater speeds. However, they are generally used to propel the train at speeds between 5-8 mph. The Incredible Hulk Coaster at Universal's Islands of Adventure is notable for using drive tires to launch the train up an incline. Some roller coasters, most noticeably Vekoma Roller Skaters (Vekoma's version of a junior coaster) and Zierer Tivoli/Force (also junior coasters) also use drive tires instead of a chain on lift hills. Drive tires are also used to power other types of amusement rides, such as ferris wheels, Pirate Ships, and other spinning rides. The Olympia Looping traveling roller coaster at Barth, Alpina Bahn and Mindbender at Galaxyland at the West Edmonton Mall also feature a drive tire instead of a chain on their lift hill. Drive tires are often used in one of two ways on roller coasters. When oriented horizontally, drive tires are often put in pairs so as to "squeeze" a portion of the train as it crosses that section of track. In this case, it is usually the brake fin that is used to propel or slow the train with the tires. When oriented vertically, they contact the underside of the train as it crosses a particular section of track. This underside area is a flat area which often has a grated metal surface to increase friction between the car and the tire. One disadvantage of vertical drive tires is that rainy weather can greatly reduce friction between the tire and the train, possibly causing the train to slightly overshoot its intended position and cause an emergency stop. A head chopper is any point on a roller coaster where the support structure of the ride or the track itself comes very close to the passengers' heads, or at least appears to do so. All head choppers are, of course, designed so that even the tallest rider, with both hands up, would be unable to touch the structure; although if a rider exceeding the maximum height does board the coaster it could be potentially dangerous. Head choppers are most common on wooden roller coasters but are also found on many steel roller coasters. The inverted roller equivalent is to a foot chopper. Foot choppers are designed such that rider's legs appear to come close to the ride's support structure, water, or other ride surroundings. For example, Dragon Challenge at Islands of Adventure had many foot choppers, where the rider's feet come within feet of the ride's supports. Vekoma's Suspended Looping Coasters also feature an intense foot chopper during an in-line-twist, in which the train approaches a section of track directly below, making it appear that the riders' feet will impact the track if the train remains on that course; but the train undergoes an in-line-twist right before the obstruction, twisting the riders onto their backs as the above track crosses safely over the track below. On Wing Coasters designed by Bolliger & Mabillard, keyhole elements are common. These elements feature both head chopper and foot chopper effects. The train seats riders in pairs on both sides of the track and passes through the center of an object, giving the illusion that the train and its passengers have just enough clearance to fit. A helix is a banked spiral, generally exceeding 360°. Helixes can spiral upwards or downwards. Speed Monster (2006), at Tusenfryd of Norway, prominently features a launch track. A launch track is a section of a launched roller coaster in which the train is accelerated to its full speed in a matter of seconds. A launch track is always straight and is usually banked upwards slightly, so that a train would roll backwards to the station in the event of a loss of power. A launch track serves the same basic purpose as a lift hill—providing energy to the train—but accomplishes it in an entirely different manner. A lift hill gives the train potential energy by raising it to the highest point in the track (and not significantly accelerating it). A launch track gives the train kinetic energy by accelerating it to the maximum designed speed (while not significantly raising the height of the track). A launch track normally includes some form of brakes. Depending on the type of coaster, these brakes may be used in every run of the coaster (this is normally found on a shuttle roller coaster where the launch track also serves as the main brake run) or they may only come into play when a rollback occurs, normally on a complete-circuit coaster such as Stealth, Top Thrill Dragster, Kingda Ka, Rock 'n' Roller Coaster Starring Aerosmith and Xcelerator. In either case, the brakes are retracted to allow trains to launch and are engaged at all other times. Goliath (2002), in Walibi Holland of the Netherlands, has a 150 foot (45.7 meter) lift hill. A lift hill, or chain lift, is often the initial upward section of track on a typical roller coaster that initially transports the roller coaster train to an elevated point. Upon reaching the top, the train is then disengaged from the lift hill and allowed to coast through the rest of the roller coaster's circuit. Lift hills usually propel the train to the top of the ride via one of a few different types of methods: a chain lift involving a long, continuous chain which trains hook on to and are carried to the top; a drive tire system in which multiple motorized tires push the train upwards; or a cable lift system as seen on Millennium Force; or a linear synchronous motor system as seen on Maverick. Launch lift hills are like launch tracks, but instead of having it flat, it is rather at an incline. Sometimes, launch lift hills serve the same purpose as lift hills but faster transport to the top of the lift hill; or they are sometimes used to power the train up into an element, like the Incredible Hulk Coaster at Universal Orlando. Launch lift hills use mostly linear synchronous motors or linear induction motors but sometimes use drive tires. The linear induction motor is a simple but powerful type of electric motor used to propel the cars. Rather than using a standard enclosed spinning rotor and drive wheels, there is a long flat magnetic pole plate with closely spaced electric coils. This pole plate mounts on the track underneath the car and a matching metal plate attached to the car moves across the magnetic pole faces. By applying a multiphase alternating current to the poles, the pole plate induces eddy currents into the moving plate and can be used to accelerate or brake the car. Compared to other drive mechanisms, the linear motor is typically maintenance-free. The pole faces on the track and moving plate attached to the car do not need to touch, and the gap between them can be quite wide to accommodate any side-to-side car motion, so there is no friction or wear between them. Further, the magnetic coil assembly on the driving pole plates are either potted or sealed in a weathertight enclosure, so that rain, vibration, and dust do not affect motor performance or cause drive motor slippage. An on-ride camera is a camera mounted alongside the track of a roller coaster that automatically photographs all of the riders on passing trains. They are usually mounted at the most intense part of the ride, to capture the best possible pictures. The pictures are available for viewing and purchase at a booth outside the ride's exit. On some rides, such as Saw: The Ride at Thorpe Park and Hollywood Rip Ride Rockit at Universal Studios Florida, video, as well as still photographs, can be purchased upon exiting the ride. El Toro (2006), a wooden roller coaster at Six Flags Great Adventure in New Jersey, uses traditional lap restraint trains. The station is the area where lines to rides divide into lanes to board the roller coaster. The station is also an area for riders to exit. Often, on high impact coasters, guests will be able to place personal items in a safe location in stations to ensure items would not get damaged or destroyed on the roller coaster. After the ride, guests claim items. A roller coaster train describes the vehicle(s) which transports passengers around a roller coaster's circuit. More specifically, a roller coaster train is made up of two or more "cars" which are connected by some sort of specialized joint. It is called a "train" because the cars follow one another around the track as a railroad train. Individual cars often vary in design and can carry anywhere from one to eight or more passengers each. Some roller coasters, notably Wild Mouse roller coasters operate with individual cars instead of trains. A tester hill, or trick hill, is any small hill following the lift hill or brake run that precedes the main drop. After a train is hauled up the lift and begins to descend down the hill in a standard configuration, the force of gravity pulls the train cars that are still hooked to the lift. When a tester hill is used, the tension and stress on the lift mechanism is reduced prior to the train's release. Some Bolliger & Mabillard roller coasters feature this element, as well as some older roller coasters from other manufacturers. The alternative name "trick hill" comes from the illusion created from the tester hill, which "tricks" riders into thinking they have already started the main descent, when in fact they haven't. Full Throttle's loop at Six Flags Magic Mountain is one of the world's tallest and largest vertical loops at 160 feet. The generic roller coaster vertical loop is the most basic of roller coaster inversions. Specifically, the loop refers to a continuously upward-sloping section of track that eventually results in a complete 360 degree circle. At the top-most piece of the loop, riders are completely inverted. Typically, these loops are not actually "circles" but more of a teardrop shape, with the top of the loop being a tighter arc. This shape makes the loop more comfortable for riders than a true circle shape would be. Chang's (1997) inclined loop element. An inclined loop, also known as an oblique loop, is a 360° loop that has been tilted at an angle. It is not entered vertically, like a vertical loop, or horizontally like a helix. Instead, it is usually entered at an angle between 45° and 80°. Inclined loops can be found on B&M stand-up roller coasters, B&M Wing Coasters, and B&M Floorless Coasters. Examples include: Rougarou at Cedar Point; Green Lantern at Six Flags Great Adventure; Riddler's Revenge at Six Flags Magic Mountain; and The Swarm at Thorpe Park. A corkscrew resembles a helix, which rotates riders 360° perpendicular to the track. It was named for its resemblance to a corkscrew tool used to remove corks from bottles. Unlike a vertical loop, riders remain facing forward for the duration of the corkscrew element. Corkscrews are normally found towards the end of roller coaster layouts and often exist in pairs, where the end of one leads straight into the next. It is also common to see interlocking corkscrews, where the entrances and exits are parallel, but both corkscrews cross over each other's track. The corkscrew was the first modern-day inversion element to be featured on a roller coaster. It debuted with the release of Corkscrew, a roller coaster designed by Arrow Dynamics that opened in 1975 at Knott's Berry Farm. Due to its success, the element became a staple of many steel, inverting roller coasters for more than a decade. A variation of the element was created by Bolliger & Mabillard, which the company refers to as a "flat spin". Flat spins snap riders quickly through the inversion at varying speeds, whereas a typical corkscrew element rotates riders at a slower, constant speed. An inline twist is a roller coaster inversion in which the rider performs a 360-degree roll. The inline twist is often found on flying coasters and wing coasters, such as Air at Alton Towers, Batwing at Six Flags America, Superman: Ultimate Flight at Six Flags Over Georgia, Firehawk at Kings Island, Manta at SeaWorld Orlando, Raptor at Gardaland and The Swarm at Thorpe Park. It can be confused with a heartline roll, also known as a barrel roll. In a heartline roll the center of the train rotates on one axis so the height of the average rider's heart never changes, whereas during an inline twist the train rotates around the track and there is usually little to no elevation difference in the track. An inline twist (left) has an axis of rotation centered on the track. A heartline roll (right) has an axis of rotation centered on the rider (usually at chest level). A heartline roll, also known as a barrel roll, is a roller coaster inversion in which the rider performs a 360-degree roll. The center of the train rotates on one axis. The track changes in elevation to keep the train moving in the same line in which it entered the element. In an inline twist, a similar element, the track remains straight at the same elevation. The point of rotation is either above or below the rider's point of view, unlike a heartline roll which keeps the point of rotation near the middle. An example of this element is Colossus at Thorpe Park, which features five heartline rolls or The Smiler which has its first inversion as a heartline roll. An Immelmann is a popular inversion found on many B&M roller coasters. In an Immelmann, riders enter a half-loop followed by a half twist, and then exit the element traveling in the opposite direction making a 180-degree turn. The inversion is similar to the sidewinder which exits closer to 90°, or perpendicular to the entrance point. An Immelmann loop becomes a dive loop if the entrance and exit points are reversed. The name "Immelmann" comes from the Immelmann turn, an aircraft maneuver named after the World War I German fighter pilot Max Immelmann. Immelmanns are a popular first element on B&M Dive Coasters. A notable example is Valravn, at Cedar Point in Sandusky, Ohio. The Immelmann on Valravn is the tallest inversion on a Dive Coaster, as of January, 2018. A sidewinder is an inversion element where riders enter a half-loop followed by a half-corkscrew, and then exit the element perpendicular to the direction in which they entered. The element is commonly found on Arrow and Vekoma roller coasters. It is similar to the Immelmann loop, with the exception that riders exit in a different direction usually 90 degrees from the entrance point. An airtime hill is a hump-shaped hill that travels in a straight line designed to lift riders out of their seats and provide a feeling of weightlessness, commonly known as airtime. When the negative g-forces are cancelling the force of gravity this is known as floater airtime but when the negative g-forces are stronger than the force of gravity it is known as ejector airtime. The term has been used to refer to a series of smaller hills typically found near the end of the track, a common finale on older wooden coasters. In many modern coasters, a camelback can refer to a much larger, single hill that is found earlier in the ride. A batwing is a heart-shaped roller coaster element that features two inversions. The train goes into a reverse sidewinder, followed by a sidewinder. It is the inverse of a cobra roll. Like other inversions, this element has different names depending on the roller coaster's manufacturer. It is most commonly known as a batwing, which is the term used by Bolliger & Mabillard (B&M). Afterburn at Carowinds and Montu at Busch Gardens Tampa Bay are two examples that feature this element. On Arrow Dynamics coasters, such as the defunct The Great American Scream Machine at Six Flags Great Adventure, the element is known as a boomerang. A bowtie is an element similar to the batwing, except the entrance and exit of the inversion are in the same direction. Dragon Mountain at Marineland is the only coaster to feature this element. The Bowtie element on Dragon Mountain. Blue Hawk at Six Flags Over Georgia, the butterfly can be seen near the middle. A butterfly is sometimes found on Vekoma roller coasters. A butterfly begins like a vertical loop, but as the track goes up it twists 45 degrees to one side or the other, and then when it is headed down the track twists back. The maneuver is then repeated but in reverse. It is essentially the same in construction as a batwing or boomerang except for the coaster exiting the construct traveling in the same direction as it began. An example of this is found on Goudurix in Parc Astérix in Plailly, France, or Blue Hawk at Six Flags Over Georgia. A typical cobra roll, as seen on Alpengeist (1997) at Busch Gardens Williamsburg. The cobra roll is a roller coaster inversion which resembles a cobra's head. Riders traverse forward through an upwards half-vertical loop, corkscrew perpendicular to the first direction, enter another corkscrew that merges into a downward half-vertical loop that exits in the parallel but opposite direction of the entrance. It takes riders upside-down twice. There is much confusion pertaining to the correct naming of this inversion. This is because different roller coaster manufacturers give their own names to inversions. Cobra roll is the standard name used by Intamin and B&M for this type of inversion. The first coaster model to use a cobra roll was Vekoma's Boomerang model. The first of which, called Sea Serpent, was installed at Morey's Piers in Wildwood, New Jersey in the year 1984. All Vekoma Boomerangs, Tornado at Särkänniemi in Tampere, Huracan at Belantis in Leipzig, and almost all B&M 7-inversion coasters have cobra rolls. A cutback is a roller coaster inversion similar to a corkscrew; however, the two half-corkscrews are in opposite directions causing the train to exit the inversion in the same direction from which it entered. Arrow Dynamics debuted the feature on Drachen Fire at Busch Gardens Williamsburg in 1992. Only a handful of roller coasters with cutback elements remain in operation such as Twisted Timbers at Kings Dominion, Sky Rocket at Kennywood Park, Untamed at Canobie Lake Park, RailBlazer at California's Great America and Star Wars Hyperspace Mountain: Rebel Mission at Disneyland Park in Disneyland Paris. It will also be found on The Steel Curtain at Kennywood Park in 2019. A dive drop (also known as a Wing Over Drop) is a roller coaster inversion in which a half-inline twist is performed at the top of a lift hill, leading into the initial drop. Examples that feature this element include The Swarm at Thorpe Park, X-Flight at Six Flags Great America, and GateKeeper at Cedar Point. A dive loop, also known as a diving loop, is a type of B&M and Gerstlauer roller coaster inversion whose inspiration was taken from a stunt plane maneuver. The track twists upwards and to the side and then dives toward the ground in a half-vertical loop. This element is common on many B&M roller coasters. Arrow and Vekoma use a similar version of the element known as a reverse sidewinder, as seen in Arrow's Cyclone at Dreamworld in Australia and Vekoma's Ninja at Six Flags over Georgia. A double dip (a.k.a. double-drop, and double down) is created when a hill is divided into two separate drops by a flattening out of the drop midway down the hill. Notable coasters featuring this element include the 1921 John Miller classic Jack Rabbit at Kennywood Park in Pittsburgh, Pennsylvania USA and Grand National at Blackpool Pleasure Beach in the UK. The inverse of this element is known as a double up, where two inclines are separated by a level piece of track. Stampida at Portaventura Park is an example of a coaster that incorporates both a doube dip and a double up. A popular, modern variation of this element is the notable quad-down finale on Lightning Rod at Dollywood, in Pigeon Forge Tennessee. This element is similar to the classic double down, except that the drop/leveling of the track is repeated four times instead of two. A hammerhead turn is based on a flying maneuver by the same name and is similar to, but not the same as, a 180-degree overbanked turn. The train enters the element with a steep slope up and a slight curve in the direction opposite that of the overall turn (a so-called "priming" of the turn). The train then banks heavily to the side opposite the initial curve and finishes its climb while it negotiates the overall turn, beginning its descent midway through the turn. The second half of the element is the same as the first half, but in reverse order. While negotiating a hammerhead turn element, the train makes a turn of more than 180 degrees; however, because of the entry and exit curves, the overall effect is that of a 180-degree turn that exits toward the direction from which it entered, roughly parallel to the portion of track preceding the hammerhead turn. Hammerhead turns are found on some B&M hypercoasters. Examples of these coasters are Nitro at Six Flags Great Adventure, Behemoth at Canada's Wonderland, Diamondback at Kings Island and Mako at SeaWorld Orlando. A high speed section, or speed hill, is an element which appears in Bolliger & Mabillard steel roller coasters and Rocky Mountain Construction wooden roller coasters. It is best described as a mini camelback which is entered at a high speed resulting in higher negative G-forces than a normal camelback. Appearances of this element include Shambhala at PortAventura Park, Leviathan at Canada's Wonderland and Outlaw Run at Silver Dollar City. A horseshoe is a type of turnaround maneuver found on Maurer Rides GmbH's Spinning Coaster model. The horseshoe is essentially a 180-degree turnaround with high banking so that riders are tilted at a 90-degree angle or more at the top at the element. The horseshoe is named that way because the element is shaped roughly like a horseshoe, with a semicircular shape at the top. It is found on coasters such as Dragon's Fury at Chessington World of Adventures and Laff Trakk at Hersheypark. An inclined dive loop is essentially a dive loop that has been tilted. Instead of exiting vertically, an inclined dive loop exits at an angle. The only two examples are on Hydra the Revenge at Dorney Park & Wildwater Kingdom and GateKeeper at Cedar Point. Superman: Krypton Coaster's (2000) interlocking corkscrew element. Interlocking corkscrews are a type of roller coaster inversion found on B&M coasters. In this inversion, two separate corkscrews spin around each other; one turns riders upside down over the other. Despite being close to each other, the two corkscrews are not necessarily taken consecutively. Nemesis Inferno at Thorpe Park is the only inverted coaster to feature interlocking corkscrews on the same track (a set of dueling inverted coasters, Dragon Challenge at Universal Studios' Islands of Adventure, was another example. One corkscrew on the "Chinese Fireball" track interlocked with the corkscrew on "Hungarian Horntail"). Interlocking loops are an element which consists of two vertical loops. This element has been used on only two complete-circuit roller coasters. The first is Loch Ness Monster at Busch Gardens Williamsburg, and the second was Orient Express at Worlds of Fun. A pair of shuttle coasters, Lightnin' Loops at Six Flags Great Adventure, also had interlocking loops. With the closing of Orient Express and Lightnin' Loops, Loch Ness Monster is the only coaster in the world to have this element. All three of these coasters were built by Arrow Dynamics. The non-inverting loop is a variety of loop that, when coming up, twists similar to a heartline roll, leaving riders completely right-side-up when at the top of the loop. Some roller coasters with this element include Hollywood Rip Ride Rockit at Universal Studios Florida, Shock at Rainbow MagicLand, Superman: Ultimate Flight at Six Flags Discovery Kingdom, Flying Aces at Ferrari World, Soaring with Dragon at Hefei Water Theme Park, DC Rivals Hypercoaster at Warner Bros. Movie World and Tempesto at Busch Gardens Williamsburg. A Norwegian loop is an element made out of two elements: a dive loop, then an Immelmann; forming an inversion that looks like two side by side loops. This element is similar to the flying coasters pretzel loop, except that the train goes through a twist when entering and exiting the loop. It may also been seen as a normal loop entered from the top. It was first introduced on Speed Monster in TusenFryd, Norway (hence why it is called a "Norwegian" Loop). Other examples of a Norwegian Loop can be found on Hersheypark's roller coaster Fahrenheit and Helix at Liseberg. An overbanked turn is an element common on large steel roller coasters, particularly those built by Intamin. This element is a turn or curve in which the track tilts beyond 90 degrees, usually in the 100-120 degree range. Two examples of an overbanked turn in the United States are the first turn-around on Superman the Ride at Six Flags New England, and Millennium Force at Cedar Point in Sandusky, Ohio, which features four separate and two consecutive overbanked turns. A Stengel dive combines an overbanked turn with a camelback hill. The train first goes up a regular camelback hill, then quickly tilts beyond 90 degrees at the very top. It is the only roller coaster element named after its designer, in this case Werner Stengel. Examples of roller coasters that feature this element include Goliath at Walibi Holland and Thunderbolt at Luna Park. A pretzel knot is an element similar to the batwing, except the entrance and exit of the inversion is formed differently. On a pretzel knot, the entrance and exit of the inversion is formed to look like a Pretzel, while a Batwing is more of a heart-shaped inversion. The defunct Moonsault Scramble at Fuji-Q Highland in Fujiyoshida, Japan was the first coaster to feature this element. Moonsault Scramble was removed in 2000 due to the coaster exerting 6.2 G on riders. Recently, in 2014, a pretzel knot has been used on Banshee at Kings Island. The bottom of the element is where the ride reaches its top speed. It is currently the only coaster in operation to feature this element. The pretzel loop is a large inversion found on flying coasters from Bolliger & Mabillard such as Crystal Wing at Happy Valley and Tatsu at Six Flags Magic Mountain. It consists of a downward half loop and upward half loop. The entrance and exit points of the loop overlap at its peak forming a shape resembling a pretzel. A raven turn is a half-inversion which looks like half a loop followed by a drop and then levels out near the same height as it began. The raven turn is only usable on either flying roller coasters or 4D roller coasters at the moment and has only been used on three 4D coasters and one flying coaster. The general term raven turn refers to any inversion that follows the design described above; however, there are two types of raven turns. Assuming the train is going round the half-loop first, an inside raven turn is where the rails are below the train at the start whereas an outside raven turn is one in which the rails are above the train at the start of the element. X² at Six Flags Magic Mountain, Eejanaika at Fuji-Q Highland, and Dinoconda at China Dinosaurs Park are examples of raven turns. This element, known as a roll over on roller coasters built by Vekoma, is an inversion featuring two half loop halves, connected by two opposite-facing half inline twists. 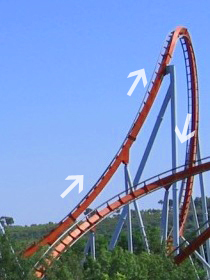 This inversion can be found on the most Vekoma SLCs. The sea serpent roll is a roller coaster inversion featuring two vertical loop halves that are connected by two opposite-facing half corkscrews. The element is similar to a cobra roll, except the trains exit the track element facing the same direction as when they entered; the trains on a cobra roll exit in the opposite direction. The element is found on the Vekoma LSM launch coaster Rock 'n' Rollercoaster or Xpress: Platform 13, on The Smiler and on Medusa at Six Flags Discovery Kingdom. It will also be found on The Steel Curtain at Kennywood Park in 2019. A top hat, also known as top cap, is an element typically found on launched coasters. The element consists of 90-degree ascent up a hill, followed by a 90-degree descent; the train exits in the same direction from which it entered. In a standard configuration, the track twists so that the train does not invert during the ride. Top Thrill Dragster at Cedar Point and Kingda Ka at Six Flags Great Adventure are two roller coasters that feature a top hat element. In a top hat inversion, also called an inside top hat or inverted top hat, the track makes a 90-degree twist as the train approaches the top. The train is on the inside of the element, and once it reaches the apex, the train is inverted. Mr. Freeze Reverse Blast at Six Flags St. Louis is one example that features this variant. Maverick's (2007) twisted horseshoe roll. A twisted horseshoe roll is an element that begins with a corkscrew that leads into a 180-degree banked turn and ends with another corkscrew that rotates in the opposite direction as the first. Two roller coasters that feature this element are Maverick at Cedar Point (United States) and Blue Fire at Europa-Park (Germany). A zero-g roll or zero-gravity roll is a roller coaster inversion where the track twists 360 degrees as it rises and falls in elevation, usually at the crest of a hill. The element gets its name from the weightless effect of zero g-force that a rider experiences during the inversion. A zero-gravity stall or zero-g stall is very similar to a zero-g roll except once the track has twisted 180 degrees on the ascent, it stays inverted for a short section at the crest and then twists back on the descent, usually in the opposite direction as the initial twist. A feeling of weightlessness is also experienced by the riders during the short inverted section. This element is mostly implemented by Rocky Mountain Construction (RMC) and include Goliath (Six Flags Great America) and Wildfire (Kolmården Wildlife Park) as well as many other RMC coasters. Premier Rides, however, have also included this element in Kennywood's 'Steel Curtain'. A splashdown is a visual element in which the ride vehicle physically interacts with a body of water, forcefully spraying or jetting water on impact. Splashdowns can be used as a natural braking system, and some feature pathways for non-riding visitors who can view and get wet, in some cases, from the splashdown element. There are two types. A natural splashdown is an element in which the track of the vehicle partially submerges underwater. It is featured on several roller coasters such as Matterhorn Bobsleds at Disneyland Park in California. A scoop splashdown is an element in which each train is equipped with two tubes – called scoops – on the rear sides of each train. The scoops are angled upwards, causing water to spray as the train passes close to a body of water. A number of Bolliger & Mabillard coasters feature the element, such as Griffon at Busch Gardens Williamsburg, SheiKra at Busch Gardens Tampa, and Diamondback at Kings Island. Depending on the width of the train and the angle of the scoops, the effect can produce different results, such as two distinct streams (Griffon) or one large plume (Diamondback). A water spout is a visual element encompassing a number of different methods to simulate a roller coaster's interaction with a body of water – the ride vehicle does not make contact with the water. Water spouts are intended to be visually appealing. Below are some examples of roller coasters that utilize this effect. Atlantis Adventure at Lotte World in South Korea features a variety of water effects including water spouts that fire in synchronized fashion in more than one area of the ride. Hyperion at Energylandia in Poland has a water feature immediately before the final brake run. The Incredible Hulk at Universal's Islands of Adventure has a water spout that fires immediately following its zero-G roll as the train dives towards the water below. Manta at SeaWorld Orlando utilizes both water spouts and fountains that synchronize at the point the train dips toward the water, giving the illusion it is skimming the water's surface. Maverick at Cedar Point features several water spouts that fire upwards as the train rounds a turn. Anaconda sometimes uses a water spout when a train enters and then departs the underwater tunnel. Backlot Stunt Coaster uses a series of water spouts when a train exits the underground tunnel and travels underneath the queue and exit bridge. Tunnels are elements occasionally found on a roller coaster and may include special effects, such as lighting, fog, and sound. The Iron Rattler at Six Flags Fiesta Texas, for example, features a darkened, above-ground tunnel. ^ MacDonald, Brady (11 April 2012). "X-Flight wing coaster premieres at Six Flags Great America in May". Los Angeles Times. Retrieved 17 August 2012. ^ Chavez, Jon (14 August 2012). "Park's 1st 'winged' coaster to debut at Cedar Point in 2013". Norwalk Reflector. Retrieved 17 August 2012. ^ Glaser, Susan (May 9, 2013). "Cedar Point's new GateKeeper roller coaster one wild and winged ride". The Plain Dealer. Retrieved May 11, 2013. ^ a b Bullock, Joel (March 5, 2015). "Fury 325 vs Intimidator: Differences & Similarities". The Coaster Critic. Retrieved June 12, 2015. ^ Urbanowicz, Steven J. (2002). The Roller Coaster Lover's Companion: A Thrill Seeker's Guide to the World's Best Coasters. Citadel Press. p. 137. ^ "More details on Rip Ride Rockit coaster, plus video". Orlando Attractions Magazine. April 23, 2009. Retrieved June 12, 2015. ^ a b "Roller Coaster Glossary". Ultimate Rollercoaster. Retrieved June 12, 2015. ^ "Types of elements". American Coasters. Retrieved June 12, 2015. ^ "Gatekeeper: The Ride - Facts and Figures". Cedar Point. Retrieved June 12, 2015. ^ "Batwing". Glossary. Roller Coaster Database. Archived from the original on 2007-08-26. Retrieved 2007-09-28. ^ Marden, Duane. "Dragon Mountain (Marineland Theme Park)". Roller Coaster DataBase. Retrieved April 20, 2016. ^ Marden, Duane. "Dive Drop". Roller Coaster DataBase. Retrieved 10 July 2012. ^ a b "The Ride". Cedar Point. 13 August 2012. Archived from the original on 16 August 2012. Retrieved 17 August 2012. ^ Marden, Duane. "Roller Coaster Search Results (Element = Dive Drop)". Roller Coaster DataBase. Retrieved 10 July 2012. ^ "Fact Sheet". Silver Dollar City. 9 August 2012. Retrieved 9 August 2012. ^ "Norwegian Loop". Glossary. Roller Coaster DataBase. Archived from the original on 2007-08-26. Retrieved 2007-09-30. ^ "Pretzel Loop Element". RCDB.com. Retrieved April 22, 2014. ^ "Raven Turn". Glossary. Roller Coaster Database. Archived from the original on 2007-08-26. Retrieved 2007-09-28. ^ "COASTER-net.com v8 > Ride Gallery > X, Six Flags Magic Mountain". ^ "Inversions". CoasterForce. Retrieved January 11, 2016. ^ McCarthy, Erin. "5 Roller Coasters Mega-Engineered to Make You Scream". Popular Mechanics. Retrieved June 12, 2014. ^ "Element: Twisted Horseshoe Roll". RCDB.com. Retrieved June 12, 2014. ^ Salterq, Rosa (May 2, 2001). "Coaster riders: Get ready to fall heels over head". Morning Call. Retrieved November 24, 2014. ^ Hernandez, America (August 28, 2014). "Missing Colossus? Magic Mountain's new ride has an old look, with a techno twist". Los Angeles Register. Retrieved November 24, 2014. ^ "Le Vampire". COASTER-net.com. August 25, 2013. ^ "Energylandia Hyperion POV 4K Mounted and Drone". YouTube. 2018. Retrieved 13 December 2018. This page was last edited on 5 April 2019, at 15:14 (UTC).